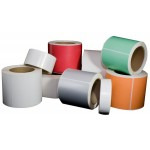 Help us specify the best custom label solution for you by providing as much information about your label requirements as you can. You don't need to enter everything here, but the more more information you can provide, the more precisely and expeditiously we can assist you. Fields marked by a red asterisk (*) are required fields.